Recently, in the post called Questions with Like, I asked you to choose the activity you would like me to write about. Most of you voted for a Speaking activity, so I prepared a set of speaking activities to practice the prepositions of place. I have already created a post on prepositions, so this time there will be no infographics just two speaking activities. If you are looking for more speaking activities, you can find a two great speaking activities here. The first activity is called Battle and it was devised and recommended by K. Folse in his book The Art of Teaching Speaking. First, print out the worksheet with 18 pictures. Each picture is different and they are labelled with letters A to R.
Ask students to work in groups of three. They should label themselves A, B, and C. Student A starts. Student A will choose a room in the worksheet. Then students B and C will take turns asking yes – no questions to identify A´s room. 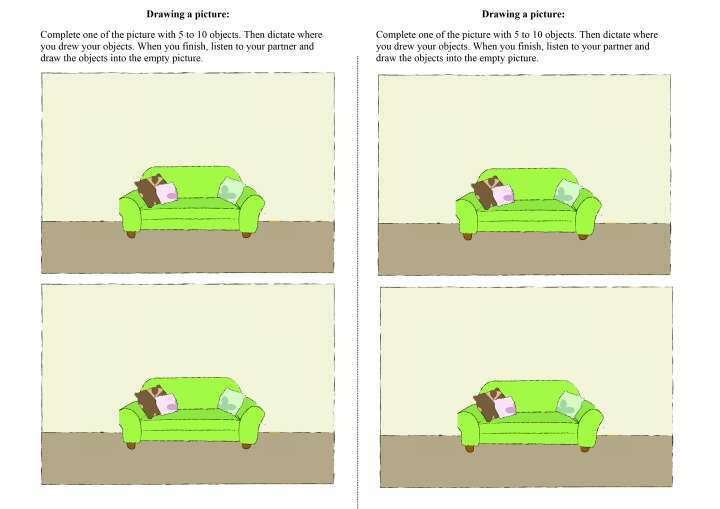 For example, B asks: “Is the table in front of the sofa?” If student A answers “Yes, it is,” student B asks another question. He continues in this way till student B answers “No.” Then it is student´s C turn. Students go on like this till someone identifies the picture student A is thinking of. After student B or C has guessed A´s room, student B chooses a room and students A and C try to guess it in the same way as they did with student A. Students keep track of how many rooms they guessed correctly, and the winner is the one who guessed most. 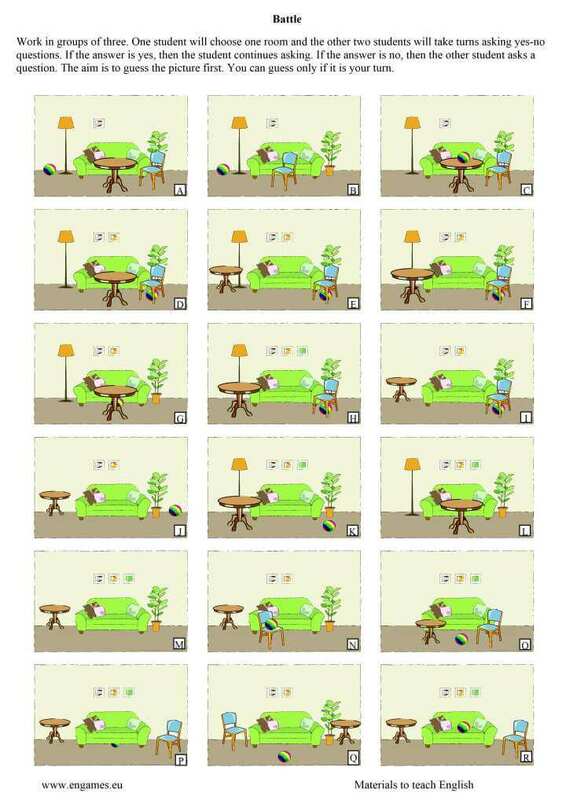 Vocabulary: plant, picture, lamp, table, cushion, plant, sofa, floor, wall, chair, ball and the prepositions of place (you find the materials to teach Prepositions of place here). Grammar: to form question with is/are and the phrases There is / there are. If your students do not know the language mentioned above, the speaking activity will not work!!! Then, each student draws between 5 and 10 objects into one of his pictures. He or she has to draw objects they know the English words for. I personally ask my students to draw pieces of furniture we learn in the textbook unit. Students sit with their backs to each other and one describes their picture for their partner, and the partners draws the objects into the picture he or she has not drawn into yet. When one student finishes they swap their roles and the other student describes their picture. At the end the students compare their pictures. Where does the …. go? I hope you will find both of the speaking activities useful and interesting, and that they will make it into your classroom. Both of the activities should ensure that your students will produce a lot of language and they will practice their knowledge of prepositions of place. Hello! The Battle activity is amazing. Thank you! Who created the images? I wish I could create something like that myself. I created the images. Thank you for your comment. Your activity is fantastic. I would really like to use it. Could I get a copy of the image? Also, how did you make these images? That would be useful too! Thank you again. I used a drawing software. I think I used the Drawplus software. Super excited to try this with my classes tomorrow. It’s a very effective way of teaching and reinforcing the prepositions and it’s going to be great fun.